by Sister Margaret O'Dwyer, D.C.
Just back from meetings in El Paso, Texas, with the Daughters of Charity Advocacy and Social Justice Committee (ASJC). It was a rare chance to expand our knowledge of border living. Seems apropos since we're about to consider, in Advent, a family that faced hardships as they migrated to find safety and peace in the midst of persecution, like some of the people south of the border. Fences are very evident in El Paso. The word "picante" comes to mind in reflecting on the experience. That's because so many people we met were "on fire" with the Vincentian charism, serving people on both sides of the fence. Contemporary models of Vincentian service typically involve an awareness of "what is needed in today's world"; projects that are bottom-to-top (solutions arising from the grassroots and expanding from there), and empowerment of the most excluded. This model was evident in El Paso. In addition to learning about local projects, we also heard from Sister Catherine Prendergast, the Daughters of Charity NGO representative to the United Nations. She explained the U.N.'s 17 Sustainable Development Goals that were approved the same day Pope Francis delivered an address to world leaders at the U.N. Sister Mary Ann Azar, D.C.
We were welcomed to El Paso by Sister Mary Ann Azar, a detention center intake specialist at Las Americas Immigration Advocacy Center. Las Americas assists people originating from various points on the globe. She shared knowledge about the distinctions between asylees and refugees. A few things struck me. 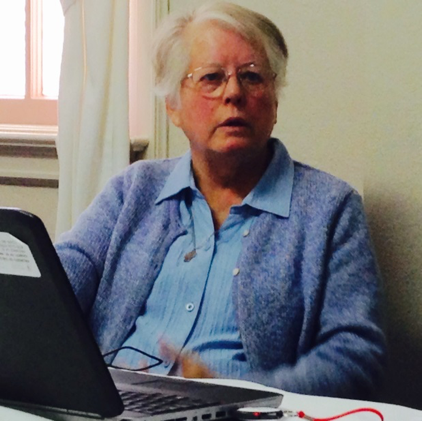 First, I admired Sister Mary Ann's involvement in a service that addresses human rights. Next, it seemed she was up to speed on contemporary needs. For example, she mentioned a growing number of new entrants to the United States are seeking freedom from extortion, some at the hands of gangs. She questioned if courts in the future would amend laws to enable asylum-seekers to gain protection because of extortion. She told heart-rending stories of asylee experiences. and Sister Mary Powers, D.C. 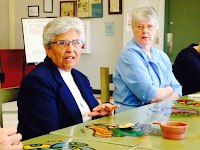 Sister Isabel Fierro is a liaison for religious for the Diocese of El Paso. She also seems astute at picking up on current needs. While some of us Northerners were testing out a prickly pear drink, she spoke to us of services in Juarez. Sister Isabel has often visited Juarez with regard to healthcare services and more recently is getting to know the challenges of trash pickers, people who collect and sell items from the dump. 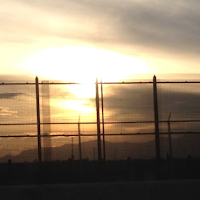 One image lingered as we drove along the border between El Paso and Juarez: an unending fence. In addition to reminding me of presidential debate topics, the fence also piqued my curiosity about life in Juarez vs. life in El Paso. Two Ladies of Charity, Maria del Carmen Casavantes and Graciela Rios, offered their views that the El Paso/Juarez area is one community. There's much fluidity between the two cities. Daily, a lineup of cars carries people with special passes in both directions, either to get to work or to get home. The cities also share cultures and families. Some of the shops and restaurants in Juarez now have locations in El Paso, so one does not need to go to Juarez to find good Mexican food. When driving along Highway 10, it is difficult to distinguish between the two cities. Lights and buildings seem to blend together. El Paso features the popular baseball team, the Chihuahuas, while Juarez is located in the State of Chihuahua. But there are also differences. "This is where the first world meets the third world," Maria said. In comparing minimum wages, we learned one in Juarez might need to work all day to earn what one earns in an hour in El Paso. The Maquiladores (factories) do not have all the supporting industries that help bolster some American cities. Juarez is fighting an image of violence while El Paso, in 2014, was named America's No. 1 Safest City by an independent research firm. in El Paso about 21 years ago. Meanwhile, at the San Vicente Healthcare for the Homeless Program in El Paso, we encountered Ray Tullius, who, with his wife Lily, founded the Opportunity Center for the Homeless. 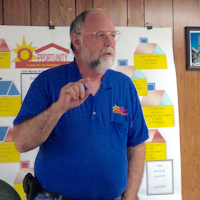 Ray, who knows homelessness firsthand, integrated his own experience into a program providing far more than shelter. No turning people out at 7 in the morning! The Opportunity Center addresses issues such as health, mental illness, substance abuse and needs of homeless seniors. Again, recognizing current needs, Ray mentioned the growing trend of homelessness among women. We also heard from Annie McAlmon and Aida Gonzalez, who regularly drive around El Paso, offering outreach to the homeless. 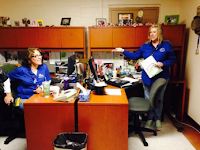 What permeated their talk was a deep sense of compassion and respect for those they serve. We met various other counselors and healthcare workers all teaming up to meet the needs of the most excluded. Very in keeping with the Sustainable Development Goals! The realities of human trafficking were explained to us by Virginia McCrimmon, lead victims specialist for the Center of Hope in El Paso. She spoke of how traffickers exploit the desire among young people to reunite with family, get a decent job, go to school or hear encouraging words they may not hear from family. After acquiring victims' identification information, traffickers intimidate and threaten them. The words of a trafficked teen about her exploiter stay with me: "I am his ATM!" How much more objectified can you get? I return to New York inspired by the passion for the excluded we witnessed in El Paso! Excellent recap. The mission in El Paso is so rooted in the Vincentian spirit. Thank you, Margaret for recounting the days so poignantly.